Stay connected to the mainland while you sail. With Cruise Planner, Royal iQ, and VOOM, the fastest internet at sea, Royal Caribbean International has proven itself as the cruise industry’s leader in today’s technological age. With so much to do on a Royal Caribbean cruise, there’s no time to spare for charting a daily agenda once you board the ship. That’s why guests are hooked on using Royal Caribbean’s pre-cruise tool. Cruise Planner makes vacation preparation as easy as a coastal breeze so you can hit the deck running on day one. Planning and personalizing on desktops and tablets is simplified thanks to the redesign with easy menus that dive into all of the possible vacation adventures. An automated calendar populates with events and activities as you schedule them. Each day is broken down by location, date, arrival, and departure, and is color-coded based on guests in your party. Why You Will Love It: Book shore excursions, dining reservations, entertainment selections, activity appointments, spa sessions, Internet packages, and beverage packages before you board. It even provides smart reservation recommendations. Look Forward To: Having a personal travel agent at your fingertips, at your beck and call, around the clock, electronically. Plan ahead or be spontaneous, it all begins with a single tap by downloading the free Royal iQ app, available on select ships. As you continue navigating your vacation play, all of your pre-planning transfers automatically from Cruise Planner. The Royal iQ app is good for more than just Type-A planners. Book Shore Excursions, reserve evening entertainment, schedule onboard activities, and modify existing reservations. Whether planning for yourself or all the members of your party, with just a few taps on Royal iQ, it’s done. Why You Will Love It: Customize your vacation using Royal iQ and Cruise Compass. As you make reservations directly from the daily Cruise Compass to your calendar, your schedule is automatically updated. Look Forward To: Future app updates with functionality to book spa treatments, schedule fitness classes, purchase beverage packages, and sign electronic waivers from anywhere on the ship. A high-speed connection on the high seas is no longer a thing to dream about thanks to Royal Caribbean’s forward-thinking investment in revolutionary technology. By pairing satellites that are closer to the earth with sophisticated antennas aboard Royal Caribbean’s smartships, speeds now match that of high-speed broadband connections, fast enough to run high-definition videos. “Our new internet capabilities allow our guests to surf, stream, and share their vacation experiences….It also allows us to provide our business clientele a new way to stay connected with their colleagues,” said Michael Bayley, Royal Caribbean president and CEO. Why You Will Love It: Stream videos, Skype calls, check emails, and post envy-inducing vacation pics in real time—because life’s greatest moments are meant to be shared. Look Forward To: Unlimited per-day packages, rather than per-minute packages, along with new bandwidth capabilities similar to those enjoyed at home. 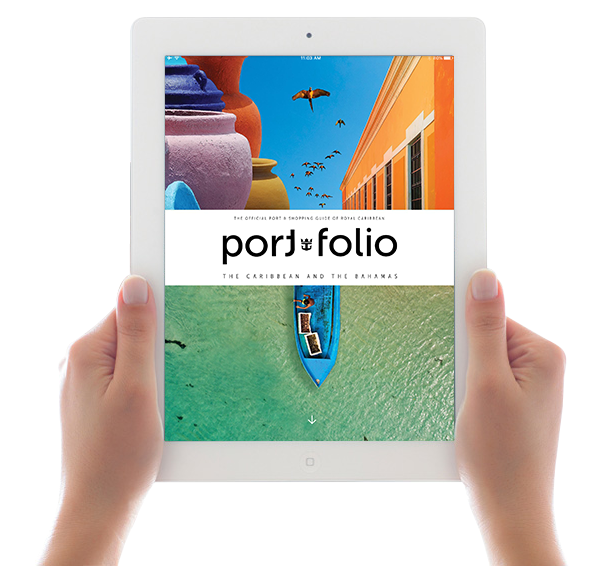 The world’s most innovative cruise line has just revamped the mobile experience for vacationers worldwide. Whether you’re an Android or iPhone user, the redesigned Royal Caribbean app gives users the power to search for the perfect cruise, stay up-to-date on the latest cruise deals, discover destinations, explore the ships in detail, and more. The app is also your one- stop shop for special deals and select rates on cruises. With the easy-to-use search tool you can book the perfect cruise at the best price. Why You Will Love It: Explore hot deals, save with regional specials, and receive onboard credits. Simply tap on Cruise Deals to save on cruises throughout the year. Look Forward To: Seeing what the Royal Caribbean experience is like while you’re at sea. Pick a ship to see what you can do onboard, browse stateroom photos, and watch ship videos.